Australia’s land is mostly comprised of rich vegetation covering more than 90% of the land area according to the Australian Bureau of Agricultural and Resource Economics and Sciences’ statistics. Unfortunately, the lush greenery is also a detriment to the construction or placement of your future home or any other building. Since an average of 50 million hectares of land are burned across Australia each year according to CSIRO Australia, the area of construction and its spatial distance from vegetation should be considered. In short, the Bushfire Attack Level (BAL) is required by the Australian Standard AS 3959-2009 Construction of Buildings in Bushfire Prone Areas before homeowners and builders are given the go signal in construction. What is a BAL Rating? The Bushfire Attack Level or BAL is a measure used to assess how severe a building’s potential exposure to bushfires are. This serves as a basis for the Australian government in establishing the requirements for construction and before granting building approvals to home builders. This is also used to propose improvements in the protection of houses and buildings from bushfire attacks. What are the BAL ratings? There are basically six BAL ratings in Australia that determine the requirements and prevention methods used in construction. BAL Low Embers, radiant heat or flames pose no significant threat of erupting into a fire within the area. There is no construction requirement needed for this rating, but builders or homeowners are advised to use a BAL 12.5 construction requirement for safety precautions. BAL 12.5 A risk of fire from embers or burning debris are significant enough to a building, but not so much as to affect windows, doors and other building elements, that is why a BAL 12.5 construction requirement is needed. Heat flux levels for this rating may reach up to 12.5 kW/m2. Heat flux levels for this rating may reach up to 12.5 kW/m2. 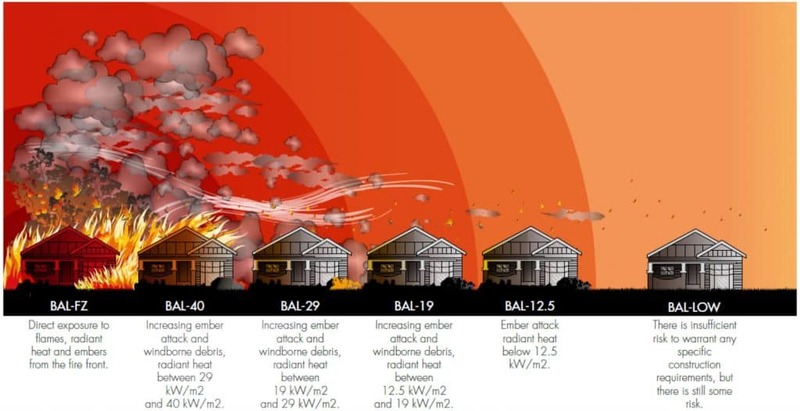 BAL 19 Increased risk levels are attributed for a BAL 19 rating because of a higher heat flux and the possibility of burning debris caused by an ember attack made worse by windborne embers. Heat flux levels for this rating can reach between 12.5 kW/m 2 to 19 kW/m 2 . The BAL 19 construction requirement for this includes homes that have building elements which can prevent the damage and spread of fire as well as removing risk elements in the area. BAL 29 The BAL 29 rating is similar to BAL 19 with increased ember attacks and heat flux ranging from 19 kW/m 2 to 29 kW/m 2 , as well as burning debris. But now, it includes the risk of buildings catching fire. Homeowners and builders are required to incorporate ember and heat flux resistant materials in their home or construction plans. BAL 40 The BAL 40 rating has all the risk elements of a BAL 29, but is significantly increased in all levels: from ember attacks, heat flux and burning debris, including a higher risk of flame exposure. Heat levels have increased to a range of 29 kW/m2 to 40 kW/m2 having construction requirements to include highly resistant materials that can prevent the burning and spread of flames. Risk elements that promote ember attacks and burning debris in the area are also advised to be removed. BAL basically assesses your area and proposes methods of construction, renovation, planning, and the materials to be used. How is BAL assessed and BAL rating calculator? Step 1 – a Fire Danger Index (FDI) ranging from 0 (low) to 100 (catastrophic) is selected based on the location. Other FDI can range up to 150 depending on additional elements included by your area’s Fire Service. Step 2 – the vegetation in the area is classified and selected from the seven types: 1) forest, 2) woodland, 3) shrub land, 4) scrub, 5) malle/mulga, 6) rainforest, and 7) grassland/ Tussock moorland. For areas with more than one type of vegetation, the class that poses the highest risk of bushfire attacks is chosen. Step 3 – the distance from the housing/ building area to the classified vegetation is calculated, but only for vegetation within a 100 meter radius of the house or point of interest. Step 4 – the slope of the vegetation in relation to the building is measured and classified as “upslope” or “downslope”. Step 5 – the BAL is then determined from a table based on the AS 3959 (2009) with the input of the correct FDI based on location. Basically you ise AS 3959-2009 to find each step and then use these values to calculate the output of what your site will be based on the information in the guide. BAL rating can increase the cost when building your house. Depending on the level of BAL rating your block of land is, it can dramatically increase the cost of building a house in Australia. This is because of the requirements to meet the level of the property to be constructed mean extra materials and labor is needed. Where possible, Construction should be located near existing cleared areas close to the property. Despite this, only a few homeowners know about BAL and are not aware of how prone their homes are to bushfire attacks. They are also not aware of the level of risks their area can get. That is why home building professionals are highly recommended to help you assess, plan and build your dream house that gives you not just a comfortable place you can call home, but also a safe place that can stand the tests of time. Consult your builders or planners with regards to BAL. Have your area assessed for its BAL rating. Your home should stand in a Fire Protection Zone. Eliminate or remove fire hazards around your home. Be aware of seasonal changes in your area (e.g. lightning storms, humidity). Make sure your home is fire safe.